So, it seems like my obsession isn't fading off any time soon - so I will make a thread here to document some of the stuff I do. I played violin in music school from age 6 to 14 - then replaced it with a guitar and singing. I then went via piano to upright bass. However, violin is still my "first love" and I play it sporadically. I still regret my desicion made at age 14. 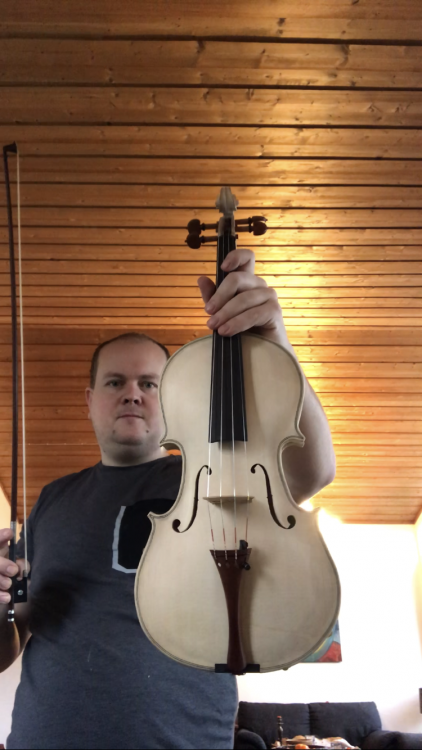 I am now in my 30's , and the technical aspect of violins is something very facinating. So much so that I picked up making after having done some repair&restauration work. This is pure hobby for me thou. 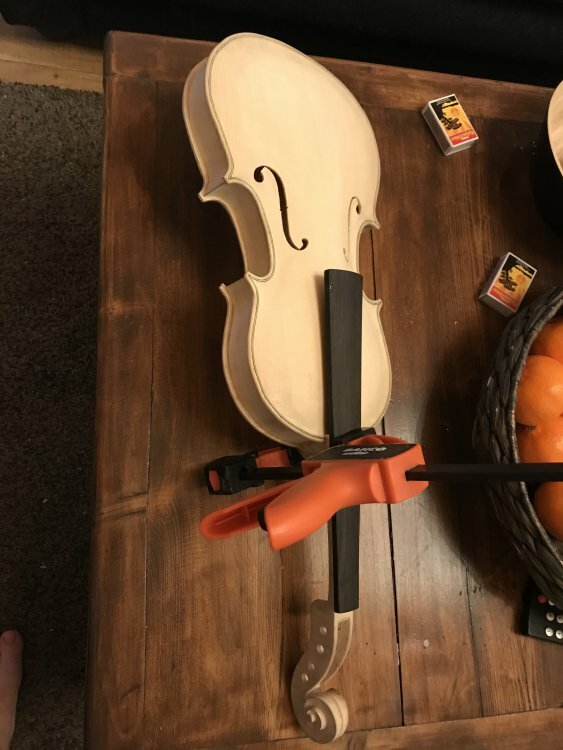 I am not aiming at a professional career within violin making. However, that does not mean that I go half heartedly into things. It just means that things go a bit slower. I wont go much into details on my #1 - which I just finished making. It is currently being varnished. It has many flaws, really long corners, a funky scroll and a bit akward arching. (i mostly eyeballed it.) However, it is made 100% by me, which is a victory in itself. 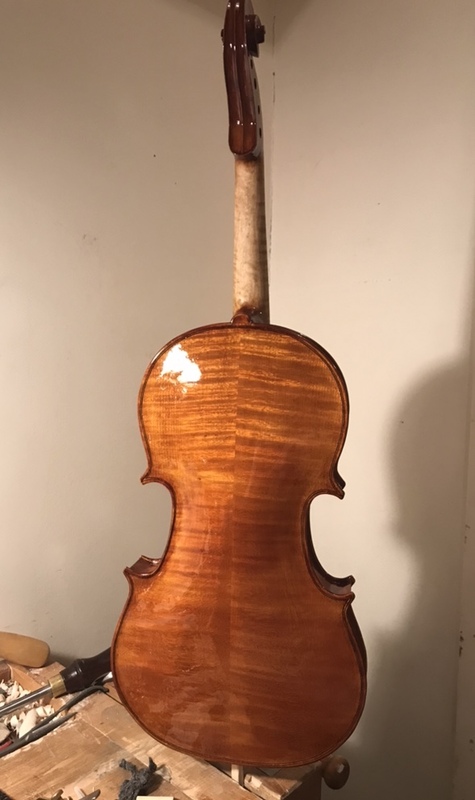 It does not sound as bad as I feared either (at least before varnish) so I am fairly happy with my efforts. I have just started my #2. It will be based on Del Gesu's 1733 "Kreisler." I bought the mold and arching set made by Acadamia Cremonensis as it has all the archings etc. already made. I made my first mold, but I would rather use the time I have available to making instead of making molds. I also believe my results would be slightly more accurate like this. Feel free to chime in, comment on things - good and bad - and dont be afraid to deviate from the topic. Here are a few pictures of my #1, with trial set up and before final edge work was done. Finished the build just around christmas. Like I mentioned above, having completed is for me a victory - so all the flaws does not matter that much. However, from the next one - take your gloves off. 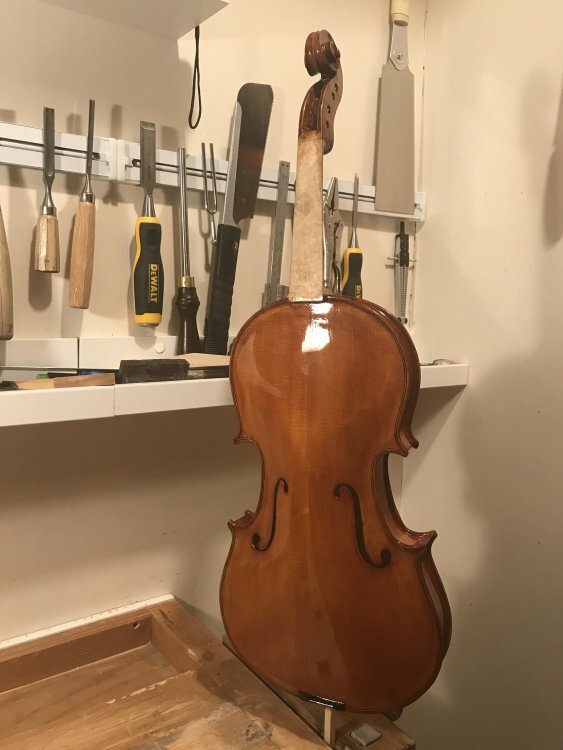 Same, my #1, during varnish. Almost done. 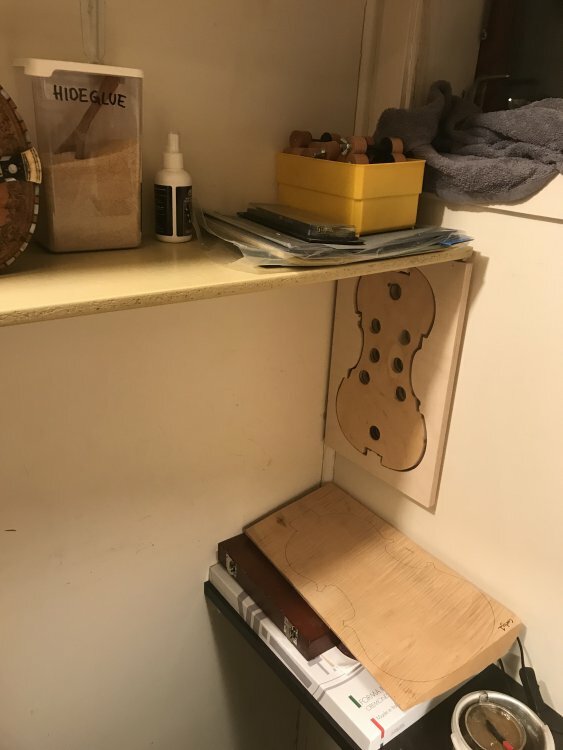 No bench-tread without showing my bench! 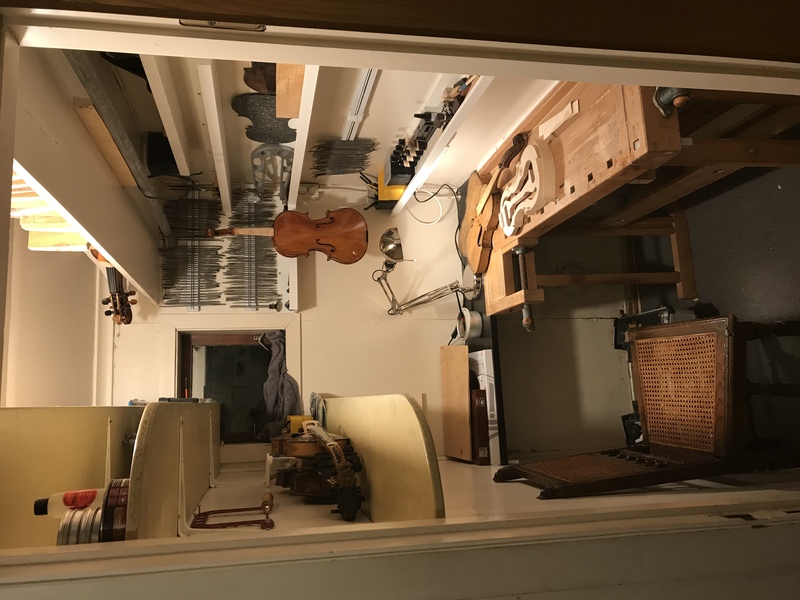 So here it is, my workshop - more like a converted storage room. 1.91m2 (20.55sq ft) Anyone have a smaller shop?? With all my little shielfs and magnetic tool holders, it actually feels quite spacious. I do all the work unplugged. 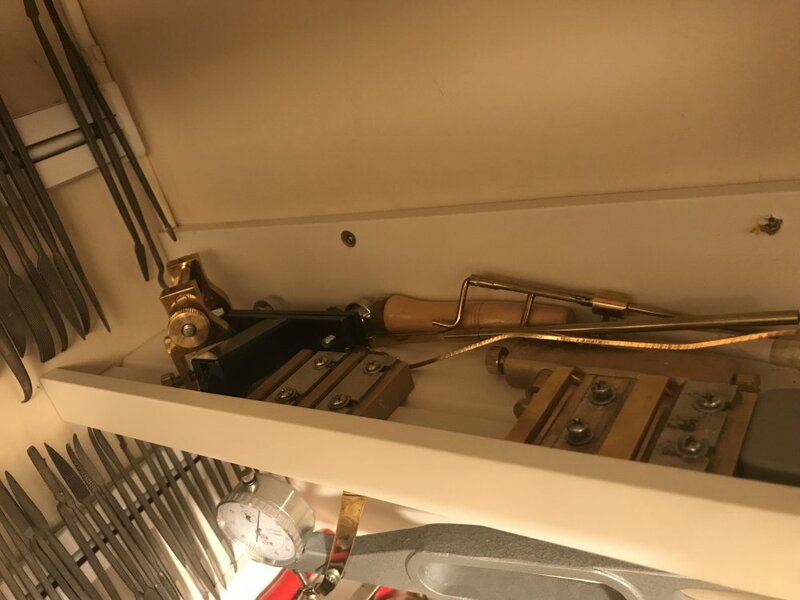 Only hand tools. I use electricity to heat my glue, to heat the bending iron and for light and room heat, but no bandsaws or other powertools. 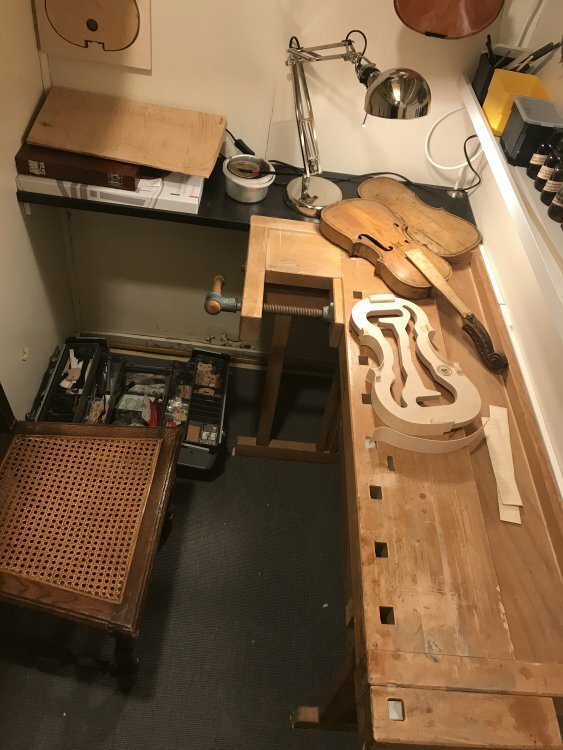 My #1 is hanging by it's neck, (the start of) my #2 is laying on the bench and as you can see there are some repair/restauration projects as well. Some completed, and some ongoing. Nice nut brown color. 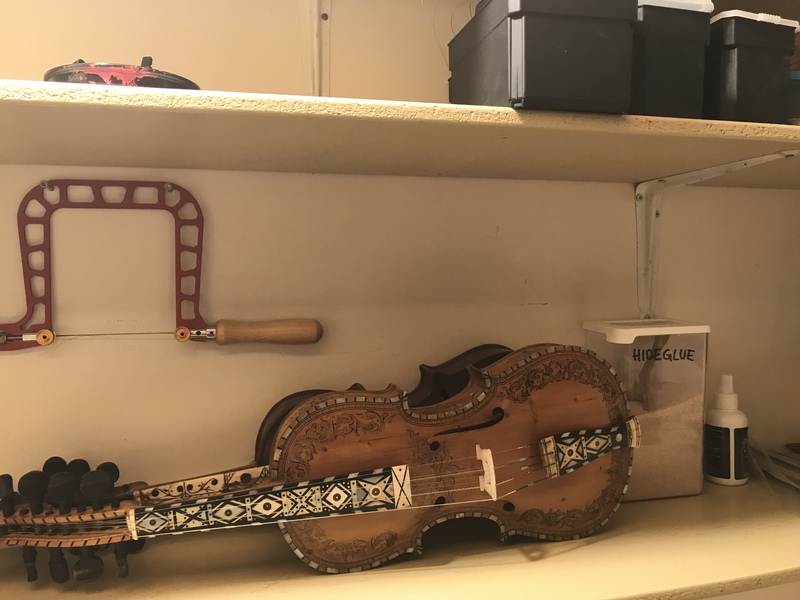 My #1, warts and all, is my daily practice fiddle. I think you should be proud of your first, and not just for finishing it. 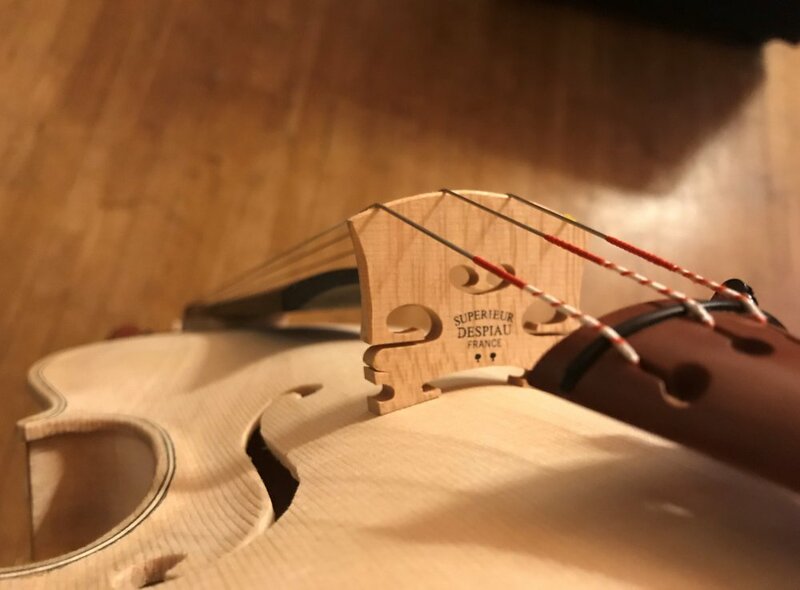 Warts and all, it’s a good looking fiddle. I’ll be watching for #2. 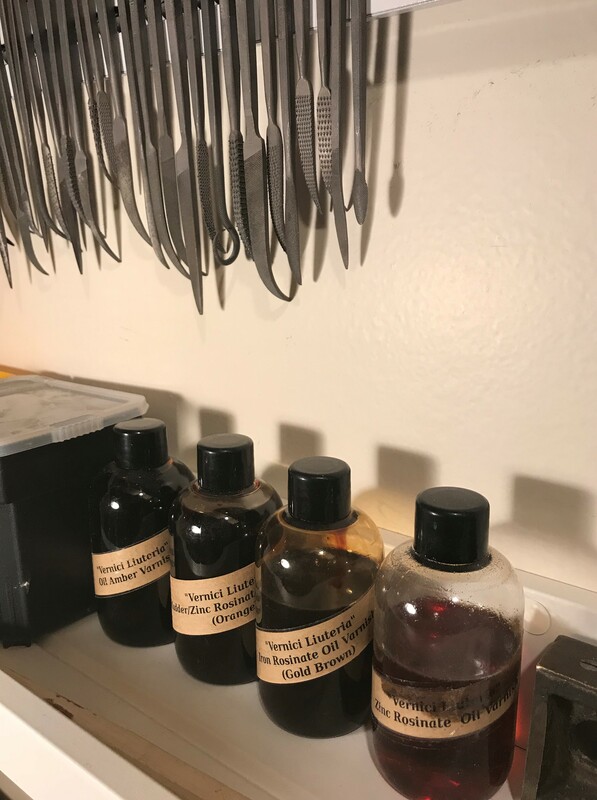 I do agree, that there is a lot of learning the mold-making process. 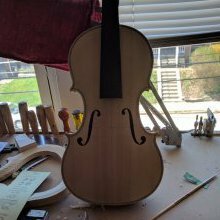 The plan is that my #3 or maybe #4 will be a Hardanger fiddle. Then I will surely make a new mold aswell. I did feel that at this occation it would be good to have a complete "guide" - not just the mold, but the arching templates etc available from someone else. I have no-one to look me over the shoulder and point out that this or that is wrong, so I'm gonna go with the bought mold on this one. My silent mentor. Thank you. Good to hear that you get to use your first one! Do you live in Stavanger? Wow, that is a LOT of files!!! I am totally ignorant, so don't let it go to your head, but I am very impressed with your #1! It looks amazing to me for a first attempt, imagining what *mine* would look like, lol. I am curious, how did you learn repair and restoration, and building? 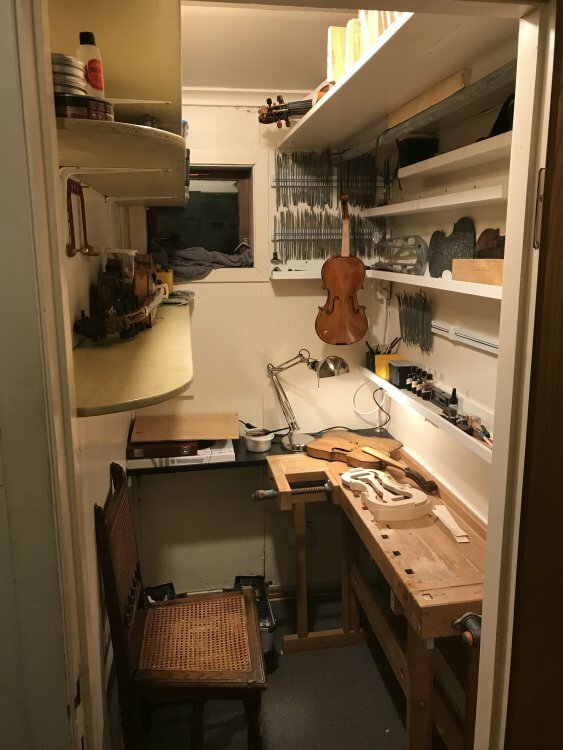 Like seeing the pictures of your tiny and tidy workshop. I am impressed. 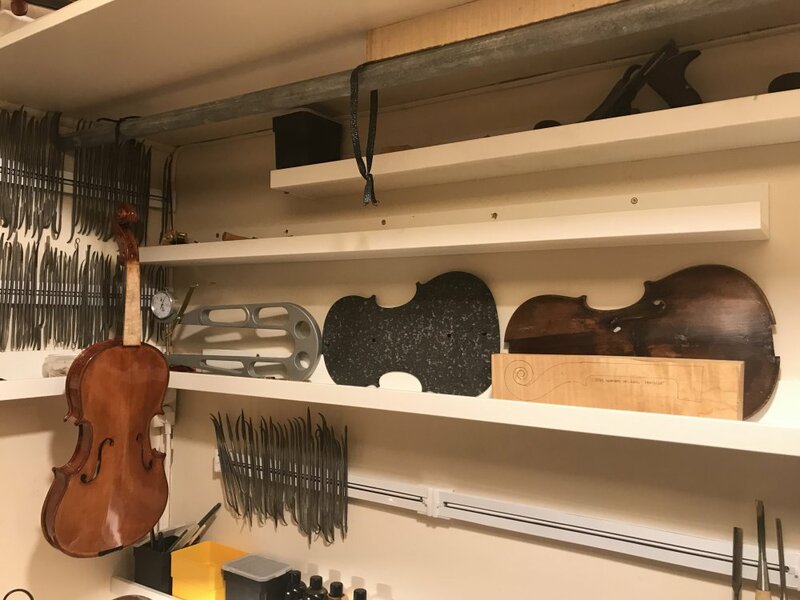 I eon’t show my «workshop» since there is currently no trace of violin in it, just some woodcarving projects abandoned until the weather gets warmer (unheated). But I do have a «Caspar da Salo» with a freshly glued crack cluttering up my living room, and a few more repair projects coming. If you’re ever in Bergen, give me a call! I love your workshop there, reminds me of my first jewelry workshop in a utility closet. Funny. I have a fairly large basement workshop, about the size of a one car garage. 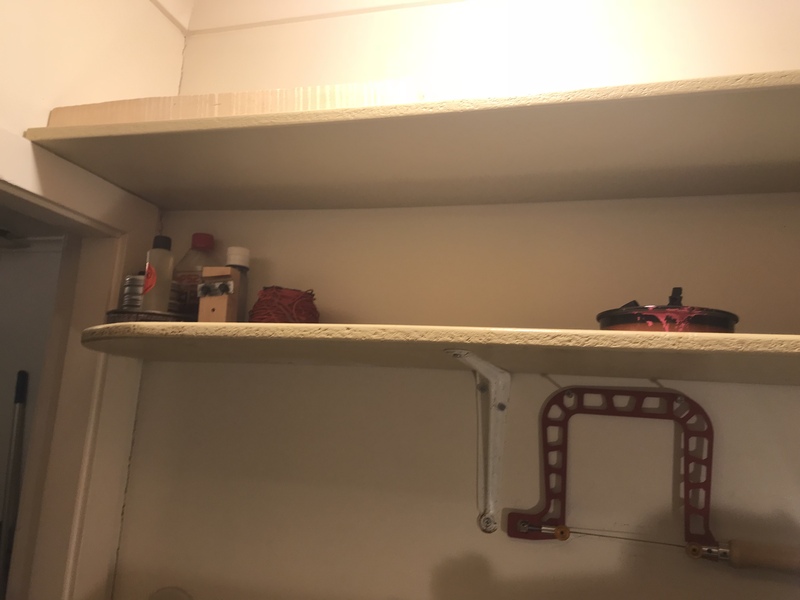 My “office “ at my day job is actually a converted closet. 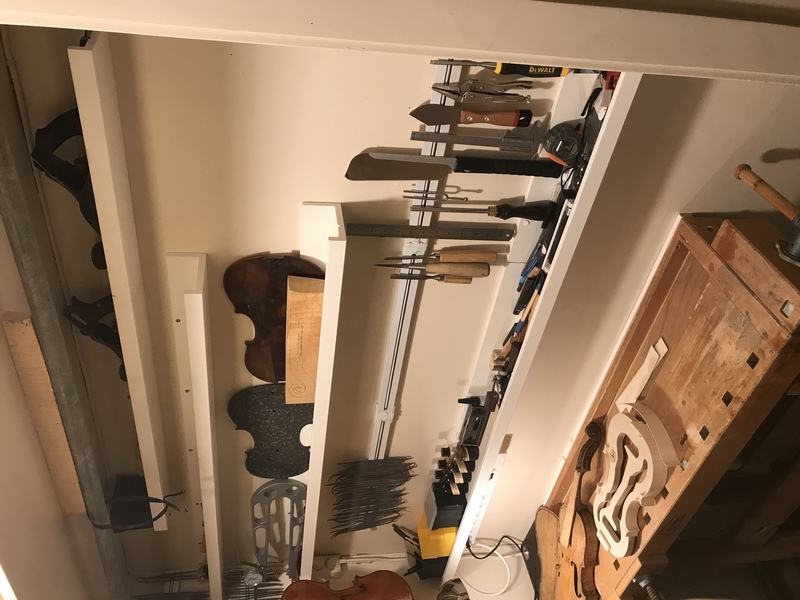 I’d gladly upgrade to Borge’s workshop. > The bridge feet do not fit well and they are too thick. 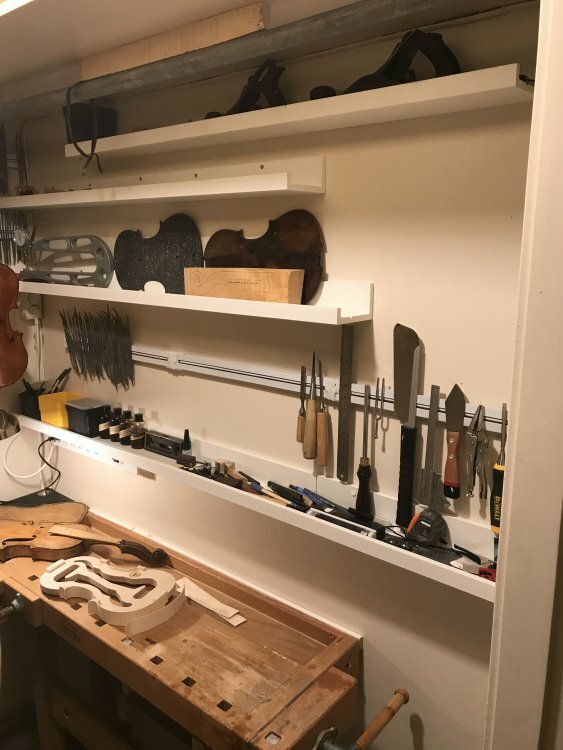 Have a look at bridges at violinbridges.co.uk (register and pay a small fee to see all the measurements). > the low point of the arching is inside the purfling which lies on a flattish area which doesn't look very elegant. 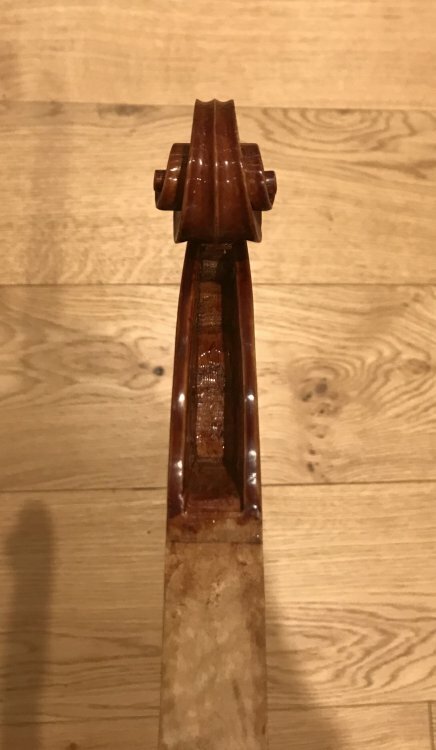 Have a look at Roger Hargrave's or Michael Darton's PDFs on edge work to see how to approach the fluting and purfling in #2. Thank you for the kind words and compliments, Carol! I am sure you could also build one, if that is something you set your mind to! The files are a lot of NOS italian Corradi / iridium files and rifflers that I did a great deal on about a year ago. Never thought I would ever need so many different profiles (I think there are about 180 different ones) but they are awesome! 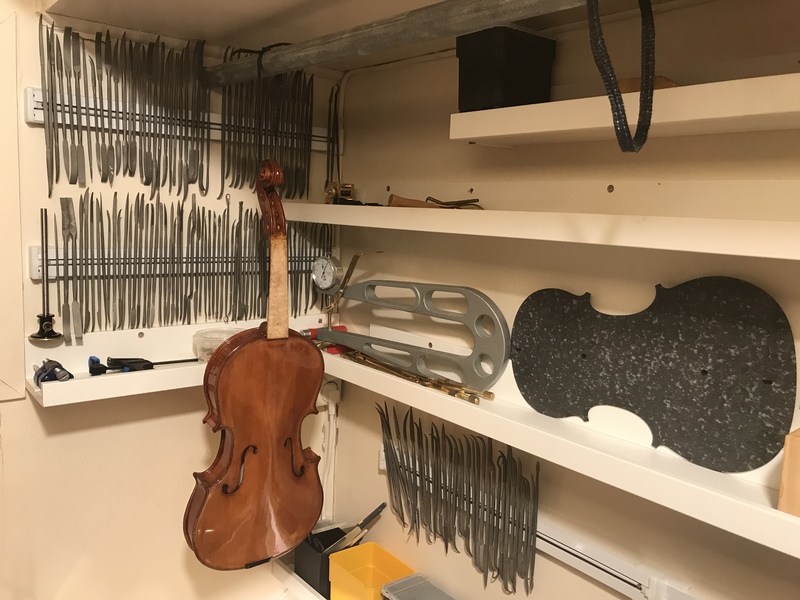 Not just on violins, but everything you can (and cannot) imagine using a file on. How I started violin repair and restauration? 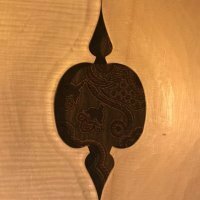 I have done some architectural restauration before, and different kinds of woodwork. So I am no stranger to a chisel. 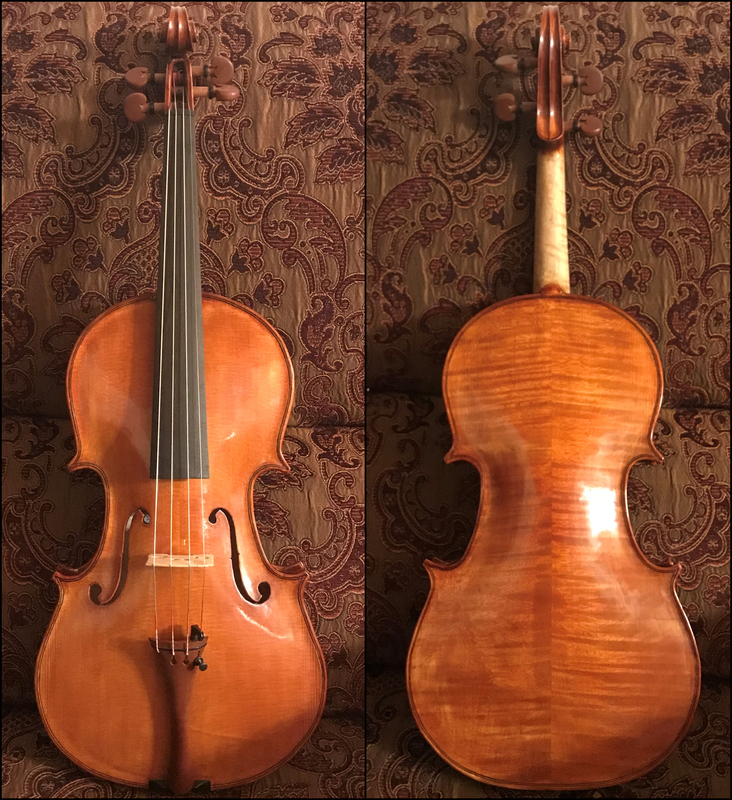 I also frequently participate in "the violin raffle" - that is buying cheap obscure instruments on classified ads online. Some have been great scores, some have been complete failures. That is also how I started doing some repair work on instruments several years ago. Learning by doing is my way of learning. Kind maestronet'ers, google and youtube have been my tutors. 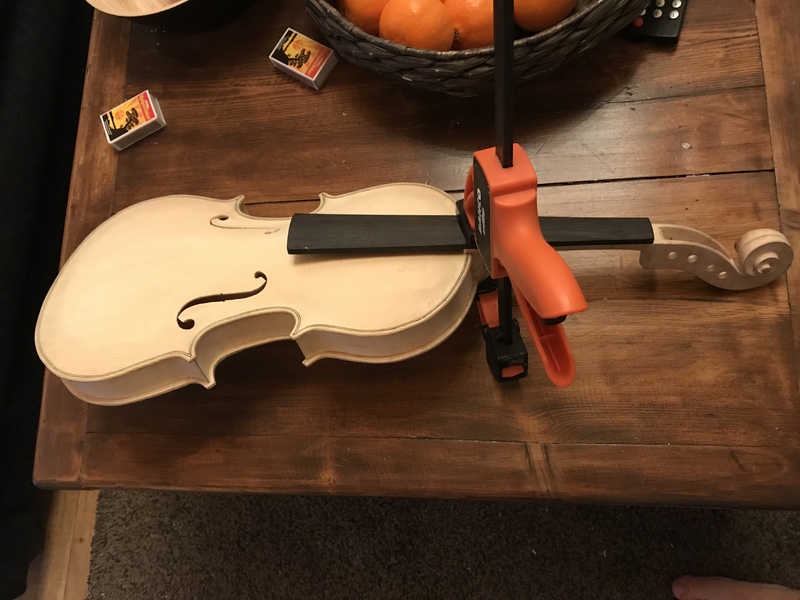 From there I bought a violin kit, and after assembling and finishing that realized that I would really like to build one from scratch. Happy you like it! I am also very happy with it. The upside is that there is no room for me to make a mess, so I HAVE to keep it tidy. I feel you... I also have a larger uninsulated woodworking shed in the garden, where I do some woodturning etc. However, the wather is so darn cold and wet - ALL the time, so not many days a year that motivation is high enough to go out there. 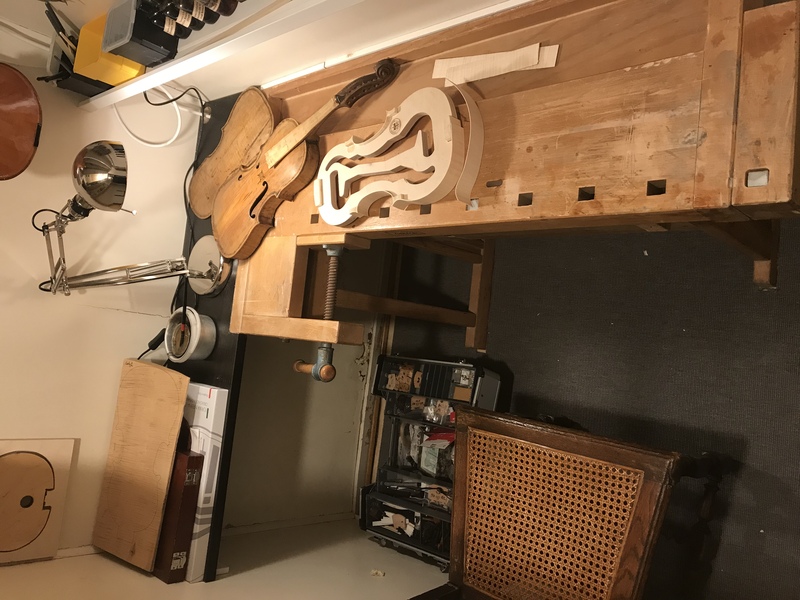 That's why I had a little violin-bench in the livingroom for a while. 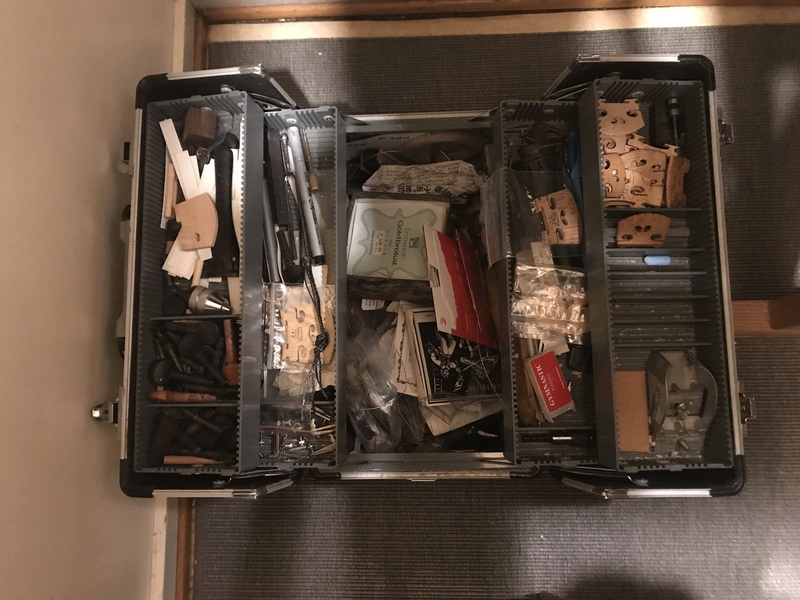 (most of #1 is made in the livingroom) but the downside is that keeping tools tucked away in boxes all the time makes it a drag to find everything. 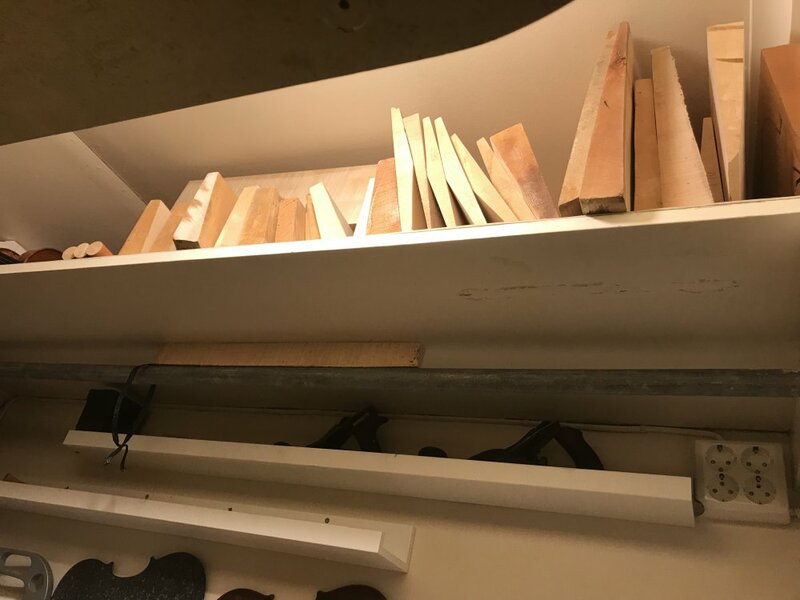 So that's where the small storage room came to mind. 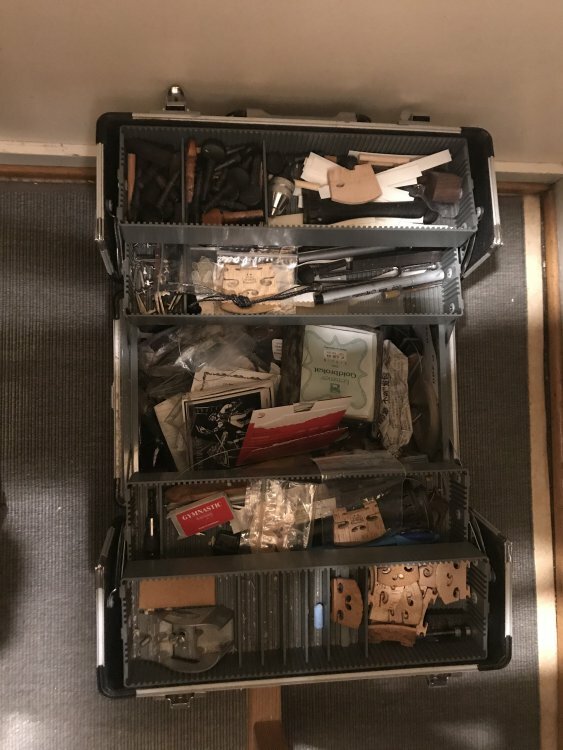 Care to show us a picture of your project? Det samme gjelder deg, skrik ut dersom du er i Stavanger en dag. Kaffien er alltid klar. Thank you for kind words and helpful feedback, Janito. I will use more time on getting the setup right once it is complete. The bridge feet are left a bit high, to allow for final adjustments. I guess I am still scared to take off too much. I will look up the litterature on edge fluting you suggested. I think I have Roger's PDF saved, but not the other one you refer to. Thanks! 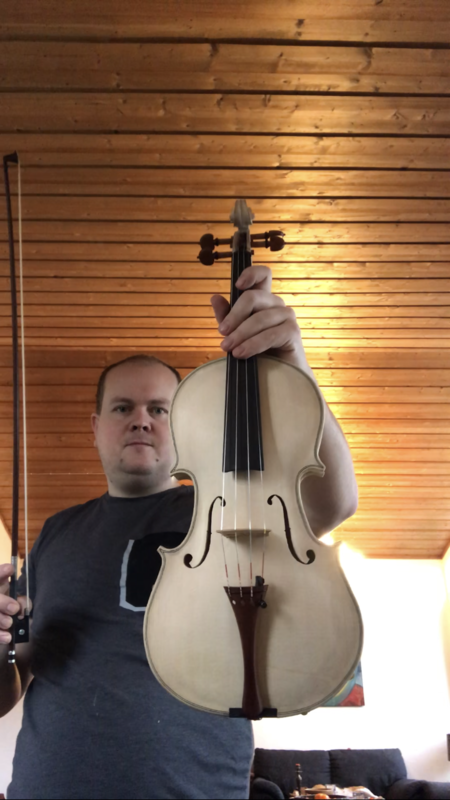 Yes, I was violin-maker of the Stavanger Chamber Music Festival (artistic director Truls Mork) during 8 years, every summer. More than 20 years ago. Btw, I am sure it is the difference between night-and-day, but your last name puts me in mind of the journalist in The Girl with the Dragon Tattoo books. I apologize if you find that reference annoying, though! I think I have Roger's PDF saved, but not the other one you refer to. That is an excellent #1! Good work! Your workshop is adorable...but I gotta ask...don't those shelves and the back of your skull ever collide? Or do you wear a helmet when you work?